Patrick Nordström was born in Höganäs, Sweden, a village known for its sandstone industry. He studied at the Technical University of Stockholm (now known as the University College of Arts and Crafts), where he specialised in sculpture. Then he moved to Copenhagen, Denmark, before accepting a job as a sculptor in Paris for the Universal Exhibition of 1900. This is where he discovered during a posthumous exhibition the work of French ceramist Jean Carriès and he visits the Manufacture de Sèvres porcelain. He returned to Denmark determined to become a ceramist and discover the precious secret frosting "ox blood". Nordström studies the basic techniques of ceramics alone, in his own studio between 1902-1907. His first pieces are almost no interest. 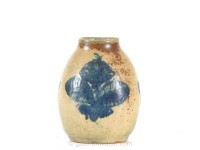 Between 1907 and 1910 he worked in Vanlose (a district of Copenhagen), using clays and ready to use German glazes. However, he continues his quest for information on the chemistry of ceramics and worn libraries. Until it finds an article in Art and Decoration in October 1910, in which are revealed details of the clays used by Jean Carriès and cooking techniques. Nordström is very inspired to experiment. During his ten-year career at Royal Copenhagen, he worked with the sculptor Knud Khyn, ceramist and attended Carl Halier and assisted Jais Nielsen. Axel Salto is his most famous student in the "sandstone" Royal Copenhagen department. In 1922, after leaving Royal Copenhagen, he moved to Islev, northern district of Copenhagen, Denmark, where he continues to experiment with ceramics and glazes in his own studio until his death in 1929.